Son, I want to offer you the wisdom of a time-tested teacher. This teacher is unlike any you have ever had; chances are you might not like him at first, but if you listen closely you’ll find he has a lot to offer. While some instructors are animated and entertaining, this particular teacher is monotone and slow-speaking. He’s not the kind to let you lean back in your chair while listening to him lecture. No, he requires active participation. To be honest, I shunned his instruction for many years and only now in my mid-twenties am I starting to see what I have ignored for so long. 1. Hard work produces respect. This goes two different ways. First, everyone respects a hard worker. I know people whom I disagree with, even people whom I don’t particularly like, but whom I respect because I know they put in their time. Second, I don’t think people can really respect themselves until they’ve worked hard for something and seen a task through till completion. There are few things more satisfying. 2. A person’s gifts are wasted unless they are cultivated by a strong work ethic. Think of the most successful people you know—people like Michael Jordan, Bill Gates, or Steven Spielberg. Not one of these folks rested on natural ability to get by, but became successful through countless hours of commitment, focus, and plain old practice. 3. Spending time in the driveway with a shovel reminds me just how easy I have it. Let’s be honest, most of us have pretty cake lives—I know I do. An hour or two shoveling snow is nothing compared with the sweat and toil of people who’ve come before me. Working hard reminds me of all that I have to be thankful for—things like a job, a wonderful family, a house, and heck, even a driveway to shovel! These things are so easy to take for granted and even complain about until I’m reminded of my many blessings while working to maintain them. 4. Lastly, and most importantly, work is worship. The biblical Hebrew language uses the same word to talk about both (“avodah”), as though they aren’t separate actions at all. Worship isn’t about what kind of work you’re doing, but the heart in which you’re working. Doing the dishes can be worship. Mowing the lawn can be worship. Shoveling the driveway can be worship. Learn this lesson and you will live a life of worship to God. 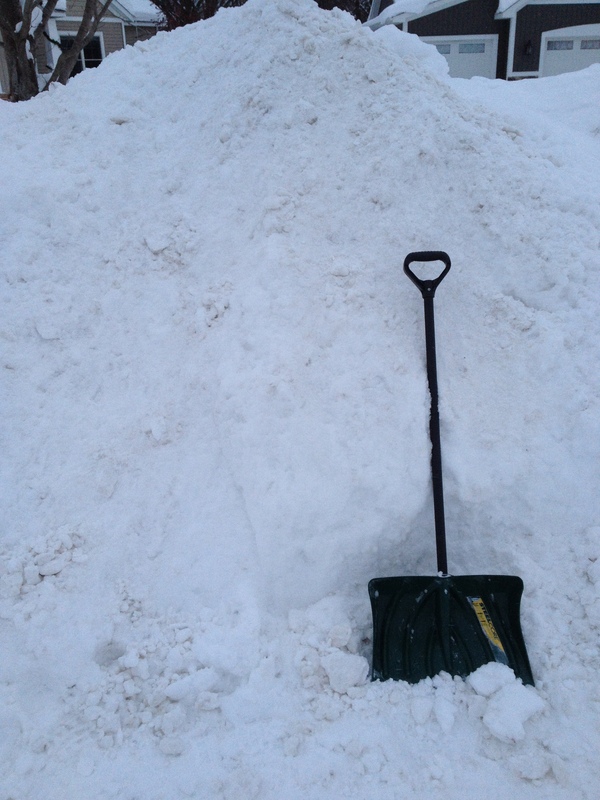 These are a few things I learned while shoveling the driveway this winter, but it’s not all. Just wait and see the ways in which you will be shaped while working hard at something. And don’t worry, son, I won’t hog all the hard work. As soon as you can walk I’ll have a shovel with your Dangeruss name on it so we can shovel together ☺. You’re welcome. Ahh! This was wonderful, Bryant! You write a good hearty message sprinkled with laughter and fun. This hit home because you’re right, a lot of life is about work and what is our attitude and approach going to be? !